The Apple Watch 4 is now official. Speaking on stage at the 12 September event, Jeff Williams, the company’s chief operating officer, unveiled a familiar-looking device with some interesting new tweaks underneath the surface. First of all, as the rumours suggested, the new Apple Watch Series 4 is bigger. Thanks to slimmer, curved bezels, the screen is either 32% or 35% larger depending on whether you buy the 40mm or 44mm version. That leads to a display that can have up to eight complications for “the things you care about”, and Williams demonstrated one face with four contacts on screen for quick contact, and another with multiple timezones. On top of this, Williams explained, the watch – powered by the fourth-generation 64-bit dual-core S4 chip – will be two times faster, and the speaker will be 50% louder. The digital crown now has haptic feedback that Williams says offers a “responsive and mechanical feel”. It maintains the swim-proofing of the previous generation. But far more interesting than these performance improvements are the health implications. The next-generation gyroscope allows the watch to sample eight times faster. “You probably don’t know what that means,” Williams explained before revealing some interesting new abilities. For one thing, it will allow the Apple Watch to not only track when a user falls, but how they’ve fallen. 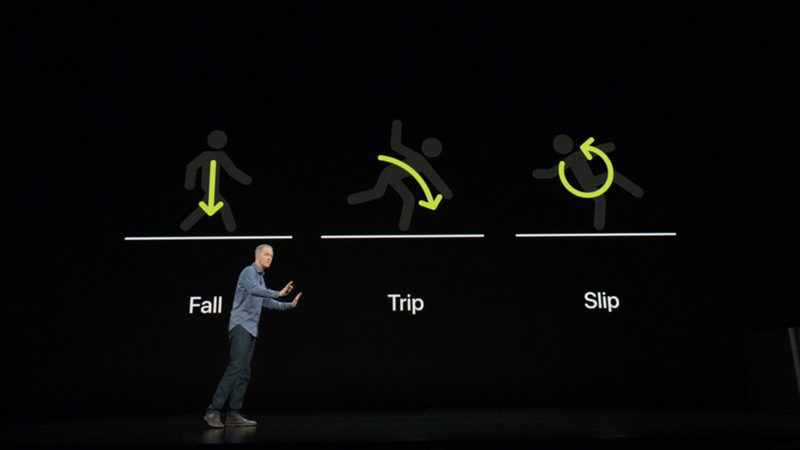 “With falls, there’s this repeatable motion pattern that happens,” Williams explains, adding the Apple Watch is now able to tell the difference between a fall, a slip and a trip. 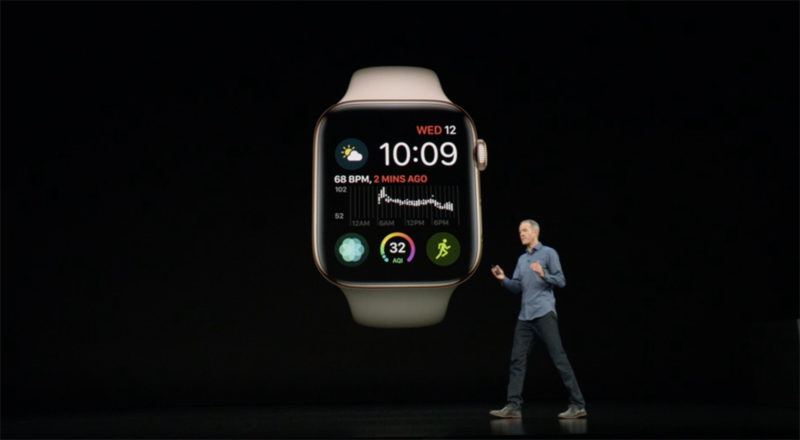 The watch will analyse wrist trajectory and acceleration, and Siri will generate an alert that can be used to call for help. If you’re motionless for a minute, Siri will get in touch with emergency contacts on your behalf. It’s “a feature we hope you’ll never need, but we’re glad it’s there,” concluded Williams. He then went on to describe three new heart features, which expand the Apple Watch’s health functions. It will send a notification if it detects a low heart rate, and can screen your heart rhythm in order to detect atrial fibrillations. If it finds anything abnormal, you’ll be alerted so you can quickly get a medical second opinion. More importantly, the Apple Watch Series 4 is the first consumer device to contain electrodes for an EKG, which you can take at any time simply by placing a finger on the digital crown for 30 seconds. It classes sinus rhythm and atrial fibrillation, compiling a PDF in HealthKit that you can easily share with your doctor. Impressively, this is FDA-approved. The health functionality will be available to American customers later this year, and the company is “working hard” to bring them to the rest of the world in time. Williams added that the Apple Watch Series 4 will start at $399 for the GPS version and $499 for the edition with cellular connectivity. In the UK, EE will be joined by Vodafone in offering cellular data, and the Apple Store is showing a direct dollar to pound conversion: so £399 and £499. The pricing of the Series 4 will also see a price drop for the Series 3 – now starting at £279 from today. As for the new version, the Apple Watch Series 4 will be available for preorder on Friday 14 September, and go on sale a week later on the 21st. Next ArticleOne year on and still no mention of Apple AirPower - what’s going on?